For several decades after the last of the Apollo missions, scientists have thought that the question of the origin of the Moon was largely settled. 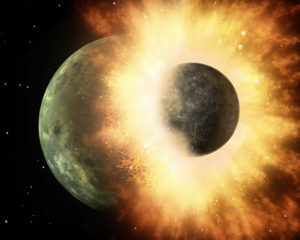 The Moon was created about 4½ billion years ago, when a Mars-size body and the proto-Earth - both with atmospheres and, likely, surface oceans - crashed into each other. While the giant-impact hypothesis successfully explains most of the peculiarities of the Moon, such as its geochemistry, lack of a metallic core, or its late formation relative to other objects in the solar system, over the years more and more evidence has shown that we still don’t know all the details. Isotopic ratios of certain elements - which can trace the origin of bodies in the solar system - have revealed that the Earth and the Moon are virtually made from the same stuff. Recently, researchers have also found more water than expected in the composition on lunar samples returned to Earth by the Apollo missions. In this talk we will review the origin of the giant impact theory, address some of these open questions and take a look at what scientists worldwide are doing to find a suitable explanation. Speaker: Javier Barbuzano, "Sky and Telescope"